Sometimes there is an unexpected news that hits the markets in the most unwanted moment – when you are in a trade. This happened yesterday when I entered a long on the AUD/USD. My long level was based on a confluence of two trading setups. The first setup was the “Volume accumulation setup” and the second one was “Resistance becoming a support” setup. As you can see from the picture below, there were pretty heavy volumes accumulated before the start of strong buying activity (uptrend). This usually means that those volumes were volumes of strong buyers who were entering their positions there. Afterward, they pushed the price upwards aggressively. This level worked also a resistance in the past, which become a support when the price went through it. There was a strong sell-off yesterday (caused by unexpected macro news) and my level was hit in the down-move. At first the price just went past it and ALMOST hit my 12 pip SL. It actually got missed just by the tiniest bit. If I didn’t have a really good broker with the tightest spreads possible, then this trade would end in a Stop-loss. Afterwards, the price suddenly turned and went upwards. The 30-minute candle that hit my level formed a nice “pinbar“. Since the price almost hit my SL I was tempted just to quit my trade at Break-even and be done with it. However, when I saw the pinbar (which signals an aggressive rejection of lower prices and strong buyers present) I decided to hold my position. So I held it and in a short time I ended up with full +10 pips profit. Still, if I didn’t have a really good broker (IC markets btw.) I am sure I would just get quoted exactly at my SL or the spreads would have widened just enough to hit my SL. None of this happened though. 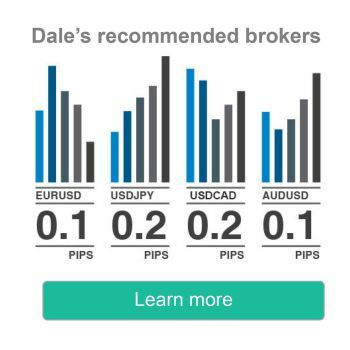 This time the difference between having good/bad broker was 22 pips (I got +10 pips whereas somebody with a bad broker would end up with -12). There were also two more trades which I took yesterday, fortunately not so nerve-wracking as the previous trade on the AUD/USD. Both trades were on the EUR/USD. There was a long and then a short. 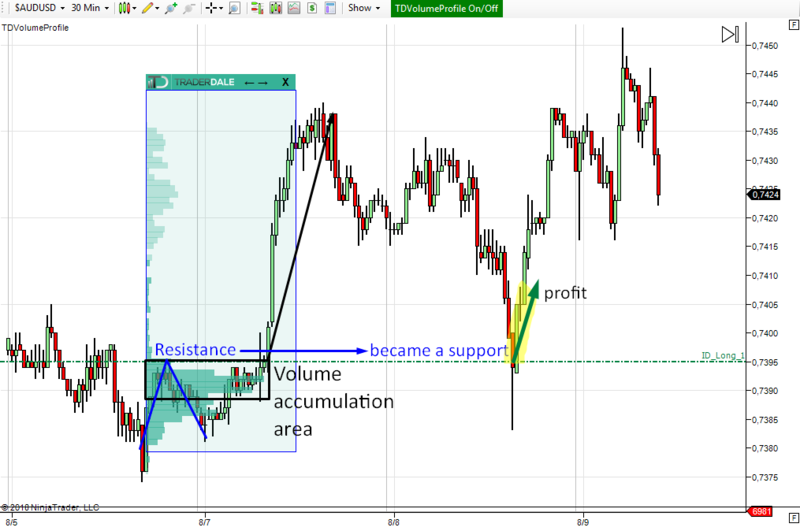 This long trade was based on the “Trend setup“. There was a nice volume cluster created within the trend so this level was quite a no-brainer for me. The reaction came quite soon and was really strong. With this trade, I caught basically the low of the day. 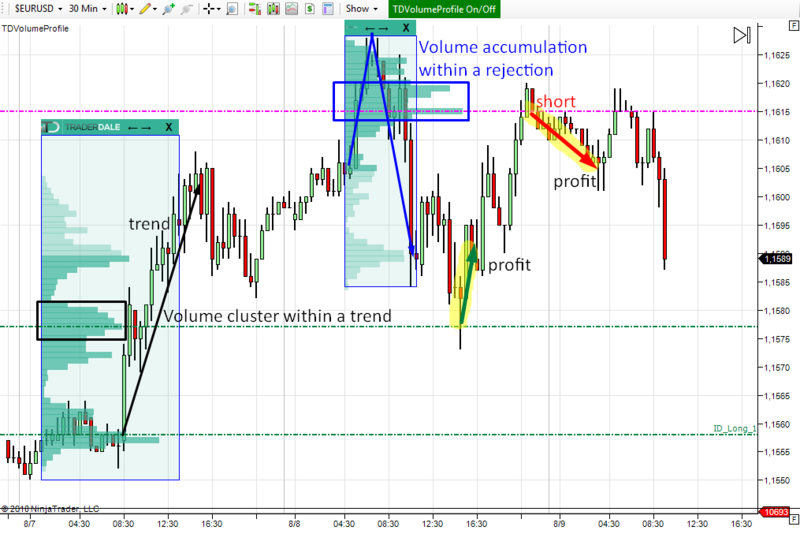 This short trade was based on volumes that got accumulated within a significant rejection of higher prices. That was basically the “Rejection setup“. Strong volumes within a rejection usually show where the sellers who took over placed most of their volumes. If the price returns back to such an area, the sellers defend their selling positions and they push the price lower again. I wasn’t exactly happy about the fact that the level got hit at the late New York hours – very close to daily rollover. Since there already was some reaction to the level I decided to hold the trade through the rollover. Another reason why I held it through was a positive swap which you receive when you hold EUR/USD short through the rollover. In the end, the price went slowly downwards and hit my +10 pip profit target in the Asian session.